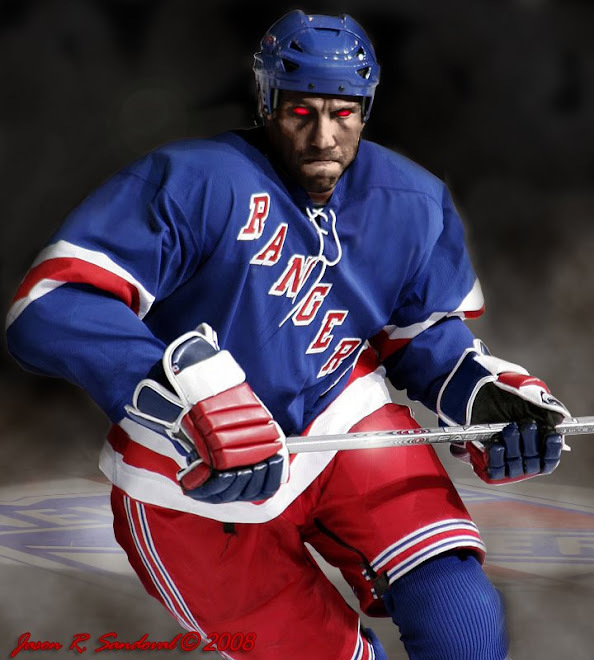 The Dark Ranger: Blueshirts Open Season Tonight, Eyes on the Cup! The New York Rangers debut their season, 7PM EST, against the Florida Panthers in the home season opener tonight at The World's Most Famous Arena. More eyes will be watching than ever as the Blueshirts "on paper" are predicted (and targeted) as a real Stanley Cup contender. On the ice is always a different matter. Aside from the talk by hockey fans, critics and experts in the NHL, it all begins and ends with the players on the ice and the locker room is abuzz. Brendan Shanahan has said of this upcoming season, "Every year there's probably about half a dozen or maybe eight teams that have the players to win the Cup, but only one of them can win. We're one of those teams right now." Chris Drury is quoted, "I think it's a good thing for me, because I always want to give more and I always want to be at my best. As a New York fan -- Rangers fan, Yankees fan, Knicks fan, whatever it is -- they always expect more, 110 percent. And they always expect you to be at your best, and that's where I always want to be, so it's a good match." The puck drops at 7pm EST at Madison Square Garden. Who would win in a fight? "The King" of the Jungle or a little tropical Panther? We'll know soon enough. Aside from the second period you have to love what you got from the team today. The blend of youth and veterans is fun to watch... I think Callahan could be a big factor for the team this year and if Staal ever translates what he was able to do in juniors to success in the NHL this team really becomes scary... it's been a while... let's enjoy this one folks! Gino...It was a mess in that second period and uninspiring with all that talent on the ice, but whatever they decided or whatever Renney said over the second break - it showed in the third. Fantastic and I agree with everything you've said. The mix of experienced veterans and gritty youth could make a special season ahead. Leetchie was unexpected as well. Great fun.